It's been a while since I've gathered up Windows tips for you. I know, I've been remiss. So this week I've got a great tip on fine-tuning Windows Vista and 7's AutoPlay settings, and I help a reader find his missing Windows 7 system tray icons. Ever wonder why DVD movies automatically start playing the moment you pop them into your PC? Or why nothing at all happens when you insert a blank CD? Or connecting your iPhone causes an options window to appear? 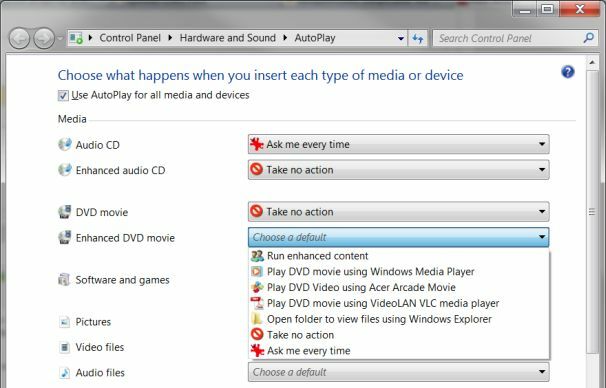 It's all controlled by Windows' AutoPlay feature, which is designed to kick into action--or not--when you connect a device or insert some kind of media. Windows Vista and Windows 7 offer very granular control over AutoPlay, allowing you to modify the settings for just about every type of media and device imaginable: DVDs, memory cards, MP3 players, and so on. Let's take a look at this handy tool, starting with how to access it: Click Start, type auto, then click AutoPlay. For starters, make sure the check box is selected for Use Autoplay for all media and devices. That's basically the "on" switch for AutoPlay. If it's not checked, nothing will happen when you insert or connect anything. Next, find the option you want to modify, click the menu button alongside it, and choose your desired action. For example, if you have iTunes on your PC but want audio CDs to play in Windows Media Center, click the menu next to Audio CD, then choose Play Audio CD using Windows Media Player. Alternately, you might want to select Ask me every time, in which case inserting a disc will open an AutoPlay window, where you can pick which player you want (among other available options). That's my preferred choice for a lot of media and devices, as I don't always want to perform the same action every time. When you're done tweaking the settings, make sure to click Save. The changes should go into effect immediately--you won't need to reboot. Reader Dennis has a laptop running Windows 7. He noticed recently that the system tray icons for power and volume have gone missing, and he's wondering how to get them back. For starters, I'd check to make sure they're not simply "hiding." By default, Windows 7 displays only a few system tray icons; the rest can be found in a pop-up window that appears when you click that little white up-arrow. If that's not the issue (and I'm guessing it's not), you need to venture into the Control Panel to modify the Windows system-icon settings. This can be a bit confusing, however, as Windows 7 has two seemingly conflicting sets of controls for this. Let's take a look at both. Click Start, type icons, and then click Notification Area Icons. Find the icons for Power and Volume, then make sure both are set to Show icon and notifications. Near the bottom of that same window, click Turn system icons on or off. Find the icons for Power and Volume (see step 2), and make sure both are set to On. If that doesn't do the trick, Microsoft has a system-icons Fix-it that might.